Using New Horizons data from the NASA mission's 2015 flyby of the Pluto system, scientists have indirectly discovered a distinct and surprising lack of very small objects in the Kuiper Belt. The evidence for the paucity of small Kuiper Belt objects (KBOs) comes from New Horizons imaging that revealed a dearth of small craters on Pluto's largest satellite, Charon, indicating that impactors from 300 feet to 1 mile (91 meters to 1.6 km) in diameter must also be rare. The Kuiper Belt is a donut-shaped region of icy bodies beyond the orbit of Neptune. Because small KBOs were some of the "feedstock" from which planets formed, this research provides new insights into how the solar system originated. This research was published in the March 1 issue of the journal Science. "These smaller Kuiper Belt objects are much too small to really see with any telescopes at such a great distance," said Kelsi Singer, the paper's lead author and a New Horizons co-investigator from the Southwest Research Institute in Boulder, Colorado. "New Horizons flying directly through the Kuiper Belt and collecting data there was key to learning about both large and small bodies of the Belt." "This breakthrough discovery by New Horizons has deep implications," added the mission's principal investigator, Alan Stern, also of SwRI. "Just as New Horizons revealed Pluto, its moons and, more recently, the KBO nicknamed Ultima Thule in exquisite detail, Kelsi's team revealed key details about the population of KBOs at scales we cannot come close to directly seeing from Earth." Craters on solar system objects record the impacts of smaller bodies, providing hints about the history of the object and its place in the solar system. Because Pluto is so far from Earth, little was known about the dwarf planet's surface until the epic 2015 flyby. Observations of the surfaces of Pluto and Charon revealed a variety of features, including mountains that reach as high as 13,000 feet (4 kilometers) and vast glaciers of nitrogen ice. While at Pluto geologic processes have erased or altered some of the evidence of its impact history, but Charon's relative geologic stasis has provided a more stable record of impacts. 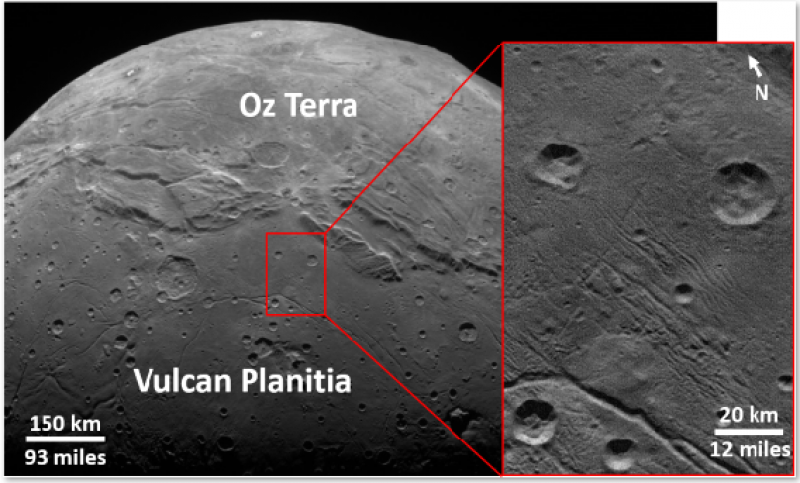 The paper published in Science is titled "Impact craters on Pluto and Charon indicate a deficit of small Kuiper Belt objects." The Johns Hopkins University Applied Physics Laboratory in Laurel, Maryland, designed, built and operates the New Horizons spacecraft, and manages the mission for NASA's Science Mission Directorate. The MSFC Planetary Management Office provides the NASA oversight for the New Horizons. Southwest Research Institute, based in San Antonio, directs the mission via Principal Investigator Stern, and leads the science team, payload operations and encounter science planning. New Horizons is part of the New Frontiers Program managed by NASA's Marshall Space Flight Center in Huntsville, Alabama.